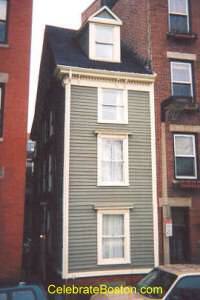 Along the Freedom Trail, directly across from the front gate of Copp's Hill Burying Ground on Hull Street, is Skinny House. The building is more than 100 years old, just over 10 feet wide, and so narrow that the front door is located in the side alley. At its narrowest point—a mere 6.2 feet apart—a resident can actually stand in the middle and touch both walls at the same time. The kitchen is 3'x6' in dimension, and along with the dining room, occupy an entire story. Boston folklore over the years has been that the house was originally built to deliberately block the view from another house. Boston's ancient North End is geographically small, densely populated, and saturated with row houses; it is therefore safe to assume a that few neighborly disputes have occurred in its history. The true reason why the house was built is lost to history. In 1920, the story of the house was that a Tory had built it to deliberately obstruct the light to his neighbor's house. Today, the story is that a Civil War soldier had returned home and discovered his brother had built a large home on his deceased father's lot. The soldier then built Skinny House on the remaining sliver of land to block the view from his brother's house. The previously described folklore had fostered the nickname Spite House for the structure also, alluding that it was built to spite a neighbor or family member. An owner in modern times summarized what it was like living in Skinny House: "Instead of doors, we have floors between each living space." The owner also described curious tourists that falsely believed some famous revolutionary hero had once lived there due to the home's proximity to the Freedom Trail. Skinny House is easy to miss. When entering the front gate of Copp's Hill cemetery on Hull Street, just turn around to see the house. The building must be, by definition, quite cozy for its residents.